Bangkok photographs capture unforgettable images of Bangkok encountered during my travel around the city. Here are some of my favorite travel pictures preserving images of yesteryear, memorable moments and unusual scenes. 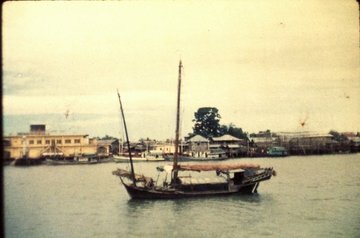 This set of old Bangkok photos submitted by a visitor beats everything I’ve got. These photos were taken in 1959! View favorite Bangkok photographs taken by others. Are there windmills in Bangkok? In the 1870s royal concessions were awarded to individuals to build canals and roads. The concession-holder was granted ownership to the strips of land 1,600m wide on both banks of the new canal. 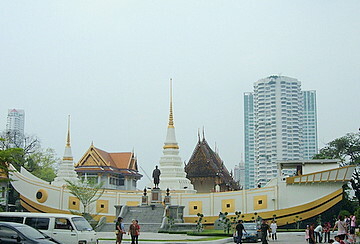 The Silom canal was one result of this concession. The surrounding area consisted of fruit orchards and windmills were used to draw water from the canal for the orchards. In the mid 20th century, the canal was covered up for the expansion of Silom (windmill) road. 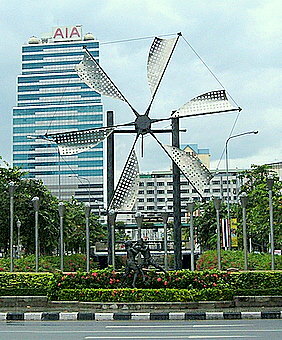 Today, there’s only one windmill left at the junction of Silom and Narathiwat Roads; a monument to a bygone era. It was only in 1880 that Thailand started her postal services. Before that people sent letters through messengers or friends. Here’s a photo of an early “postman” in Bangkok taken probably in the 1800s. Note the jong kra bane* worn by the people in the picture. 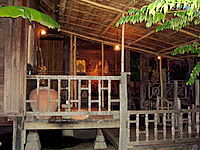 It’s hard to find traditional Thai houses in Bangkok today. Most of them are gone except for heritage homes and museums. 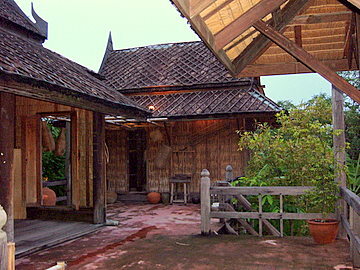 However, you can still view old Thai houses in designs from the four major regions of Thailand at Traditional Thai houses. Here’s a sample. Here are some of the photographs of antiques which are hardly ever used today except for display and ceremonies. 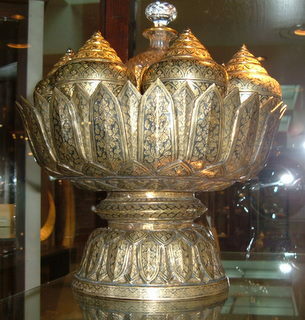 Please see Rattanakosin antiques taken at an exhibition of items from private collections. Images of famous landmarks set against a rising or setting sun have always been appealing to me. On the way to Wat Kanlayanamit on a river ferry, I snapped this photo of the old temple built in the mid-18th century. It was late afternoon and I regretted taking it against the strong afternoon sun. Little did I realize then, that it would turn out like this. Since my first visit to Wat Soi Thong I’ve been struck by the beautiful buildings in this neighborhood temple in the northern city limits of Bangkok. The structures live up to the name of the temple, “golden necklace”. One of the most wonderful images of Bangkok is the sight of numerous lighted krathongs afloat on Loy Krathong night. But this is rarely possible on the Chao Phraya River owing to strong wind, current and splash from passing boats. 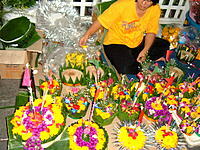 The candles on the krathongs are doused almost immediately and the krathongs just drift away. It’s only in inland waterways and ponds that you can catch this unforgettable image of Loy Krathong night in Bangkok. 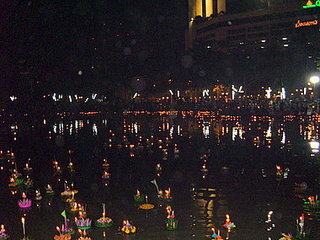 Here’s one of the Bangkok photographs of the pond in Benchasiri Park on Loy Krathong night 24 November 2007. 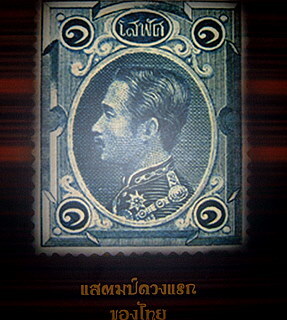 The old stamps at the 20th International Stamp Exhibition in Bangkok provided memorable photographs; images of “firsts” in the world, stamps commemorating momentous events, great men and women. Here’s an example. 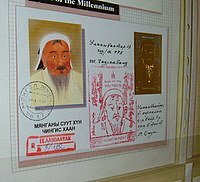 For more information, please see Old stamps. 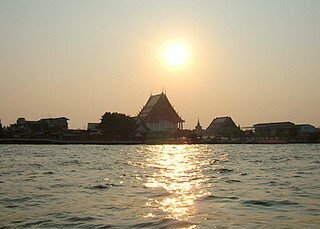 What are your favorite Bangkok photos? Share your special travel pictures with us here. View memorable Bangkok photos taken by others. These Bangkok photographs capture some unusual and sometimes humorous scenes I’ve come across while moving around the city. Some of these travel pictures were taken by sheer chance. 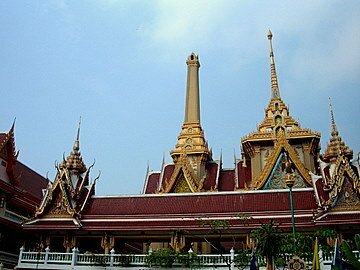 Wat Yannawa is one of those wats in Bangkok with a very unusual structure, in the shape of a Chinese junk. Here’s a photograph feature of this Bangkok temple. 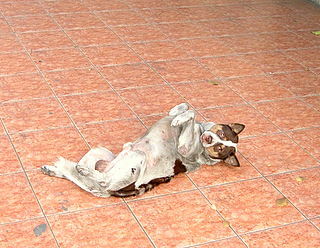 While rushing along Ploenchit Road one afternoon, I couldn’t help notice this doggie on his back with all his paws up in the air. At first I thought he was just scratching his back. On a second look, I noticed that he was fast asleep! That was until a passerby whistled and woke doggie up from his slumber. From his annoyed look, he probably thought I was the culprit. 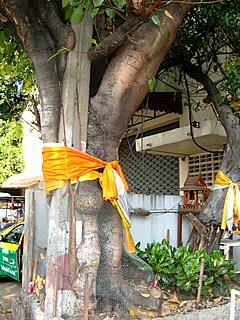 This old tree almost wrapped round a lamp post is located opposite the Royal Orchid Sheraton Hotel near the Si Phraya pier. I wonder what came up first; the tree or the lamp post? 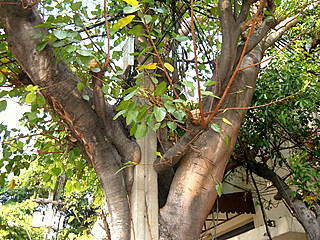 Any tree experts care to venture an estimate? Fancy sleeping on a bed like this? For highly unusual beds, nothing beats the ones in the Siam Society Hotel. 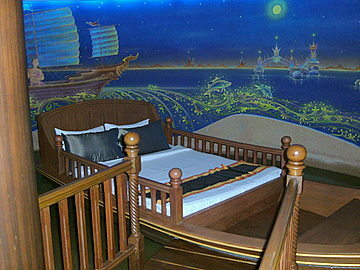 Here’s a sample of a bed on a boat in an actual pond in one of the rooms. Wait till you see the bed on a tuk tuk and the one in a full-sized Muay Thai boxing ring!! Bangkok photographs feature a selection of travel pictures and images of Bangkok taken as I traveled around the city. Here are some very special photos of Bangkok taken by a real pro, Michael LaPalme, one of our readers, 50 Long Exposure Photographs of Bangkok.